DOJ holds an evidence that will link Senator Bam Aquino to Maute terrorist group. Sec. 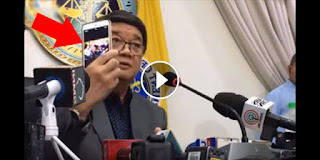 Aguirre said that there was a meeting held up with an unknown group in Lake View Resort Hotel in Marawi City at May 2, 2017. Present on that said meeting are Senator Bam Aquino, Magdalo Rep. Gary Alejano and Senator Antonio Trillanes. And shockingly after two weeks, the attack of Maute Group took place in Marawi City. Was this just a coincident that Bam, Alejano and Trillanes was there two weeks before the terrorist attacked on the city? Or this was planned? Sec. Aguirre also said that he will suggest to the government to do a further investigation on this scandal.